CW3E director Marty Ralph and US Army Corps of Engineers researcher Larry Schick provide a summary of recent flooding in the Pacific Northwest. The heavy precipitation (ending November 28) resulted in an R-CAT 2 event (an event which produces 12-16 inches of precipitation in a 3-day period). During this event one can see an orographic enhancement of precipitation amounts with a rain “shadow” (low amounts of precipitation) in the Seattle region (slide 2). The heavy precipitation resulted in several streamflow sites exceeding flood stage (shown above; slide 3). 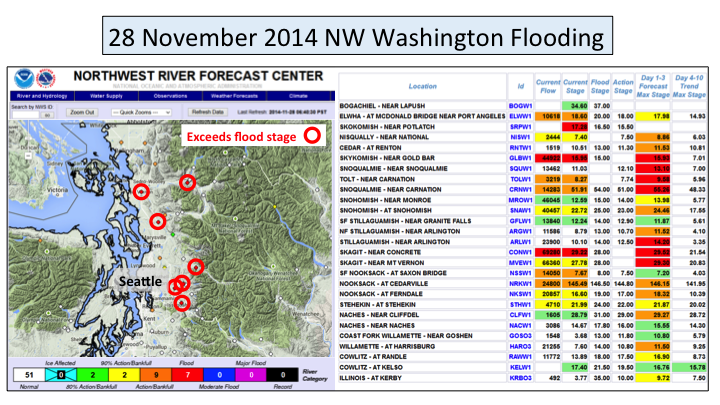 The Northwest River Forecast Center had an excellent forecast of peak flow on the Skagit River (slide 4). The attached ppt includes a summary of flood operations in general and at the sites on the Skagit River and near Mt. Rainier. Forecasts are from the Northwest River Forecast Center (NWRFC): click here for water supply forecasts. Forecasts are also from the weather service forecast office of the National Weather Service in Seattle: please click here.